This problem can be solved by pre-school children in 5-10 minutes. By programmers in one hour. By people with a higher education… Well, check it out yourself and post the answer in the comments when you have solved it. Now, those who want to solve it, do not cheat to see if anyone has posted the answer. But then, posting just the answer does not explain the logic here. This took me just few minutes, so I guess I have a pre-school mentality…. Now, think outside the box, folks. 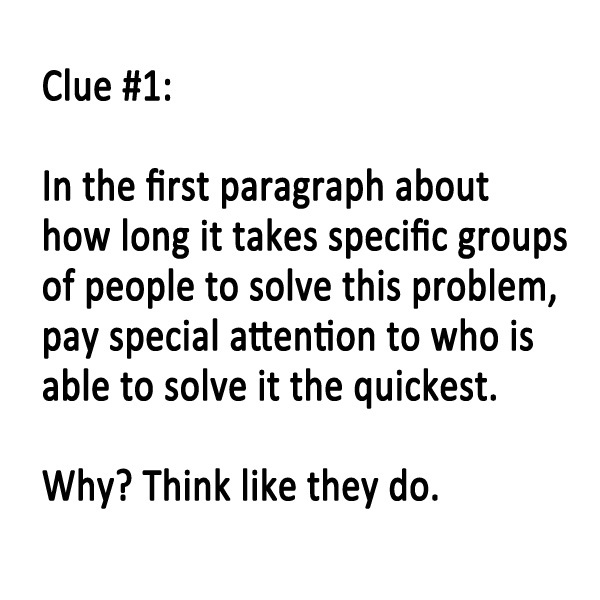 There are a couple links to clues below the problem if you get frustrated, as well as a link to the answer and logic used to solve the problem. Answer and logic, click here. I lost patience which is always the way with me.. would never have got it without looking at the answer!! Hey, but you gave it a try. I did but only for about 5 minutes!! I used to be a huge puzzle person. I loved solving problems, especially logic problems and mathematical stuff. I’d sit for hours if I needed to just to solve one problem. Now, if I can’t figure it out in 10 minutes, I’m done. I lucked out on this one. Figured it out right away. This ever-green piece must be one of the very few if not the only one to invite comments even after 4 to 5 years after its date of posting!!! It still brings a lot of traffic. so 6889 has 6 closed loops. I, too, lost patience after maybe 5 minutes. I was correctly working on visuals, like how many digits in each line are the same, or counting the occurrences of a certain digit. I’ll never know if the correct answer would have occurred to me. I just approached it from a pre-school age around 4 or 5 yrs. old. What would they be looking for? Bam. Got it. I spent almost 40 minutes trying to figure out this problem and didn’t get! You need more patience! But I did get the answer of 2 becasue you need to count the circles in the numbers. Nope. didn’t even come close. LOL! Thanks… I am positive you do have a highly developed brain. To solve the problem, you just have to look at it form a different perspective. The true meaning of thinking outside the box. You are NOT an idiot! I don’t ever want to hear those words from your computer keyboard ever again! You are a genius!!! Your writing skills are unique and very rare. You have an incredible talent – I wish I just had10% of what you have. So problems like this aren’t your forte… big whoop. Some people see it, some don’t. Doesn’t mean a damn thing towards intelligence. Okay, I think I will end my scolding now…. And I’m serious, I never want to hear you type anything like that ever again. I don’t ever want to hear you say (type) that again! Yes, my finger is still wagging! I didn’t solve it, and yet I have no trouble solving Mensa problems. I don’t think they mean anything either to be fair. You might be correct about moving out to a child’s frame of mind. But not entirely. 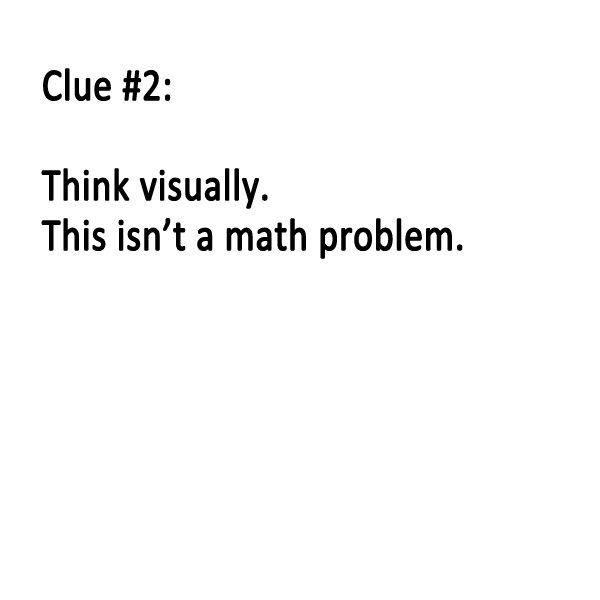 Actually, I discovered the answer by maths and not by visual view. I discovered the padron 8=2, 6=1, 9=1 and 0=1 by decoding the value of each number basing myself in the data presented. And so on, I was able to ​​found the values in about 5 minutes. It’s actually a math problem. You just need to consider the series as a bunch of signifiers rather than as numbers proper. You are correct but have grossly over worked this problem – made it much more difficult than necessary. You simply assigned a 0, 1 or 2 to the numbers according to the number of closed loops in them. For numbers which equal 0 (3,5,7,2 and 1 are equal to 0), that is because those numbers do not have any closed loops. Therefore, 0 loops. For “6,0 and 9 are equal to 1” that is because each of those numbers has one closed loop. Therefore, 1 loop. For “we realize that 8 = 2” that is because 8 has two closed loops. Therefore 2 loops. A pre-schooler is not able to make the connection you did. Plus, your connection was unnecessary. But good job and making it making it work mathematically, but it is the exact same theory as visually counting the closed loops in the numbers. So, in essence, it is not necessary a math problem unless you want it to be a math problem. It’s kind of like going from Paris to London. You can go directly, or go via way of Moscow. You got to your destination, but took the Moscow route. But honestly, that’s exactly how I solved it as well – maybe “simpler” if you don’t think about the visual shape. It’s impressive how you did that. And is exactly right. Just so we arrive at the destination. As a Mensan, I often over-complicate things. I am actually horrible with multiple choice questions because somehow in my mind, I can make several answers work. I just made myself focus on thinking like a child and got this one quickly because of that. Otherwise I would have taken much longer and probably came up with your system. LOL… you are funny! I am very glad you enjoyed the problem. That’s the whole point. For fun. V nice. Confess I clicked to find the answer. Dont know how I missed getting notifications of these posts. Not sure. Are you still following? I know that with the upgrades a few people have been “dropped” and had to refollow again. Yes, I got back just now. Thanks. Could I reblog this one with credits? Of course! You, or anyone, is always welcome to reblog. Oh, you know… You were subscribed to Motley Dogs, not Motley News before. That’s why you haven’t been getting any posts – I haven’t posted for a while on Motley Dogs. I’m redoing the theme at the moment and have a few bugs to work out. The problem as stated is ill-posed; it has 10 correct solutions. And what are they? And how did you arrive at them? Simply stating that it has 10 correct solutions doesn’t make it so. Yes, makes perfect sense because those numbers (2, 1, 7) do not have any closed loops (and there are others, too). figured it out. took me couple minutes, though. that’s not how I solved it at all, although I see how many would go that route. I started by isolating 0’s… 5555=0 so 5 must =0. 2222=0 so 2 must equal 0. 1111=0 so 1=0. To get the 8 i saw 0000=4 so 0=1, 9999=4 so 9=1, so 8809=6 with 09=2 means 8 = 2. Which means 2581 = 2. All the discussion about how you arrive at the answer doesn’t address the fact that the question is B.S. It’s a false premise designed to make you feel foolish. 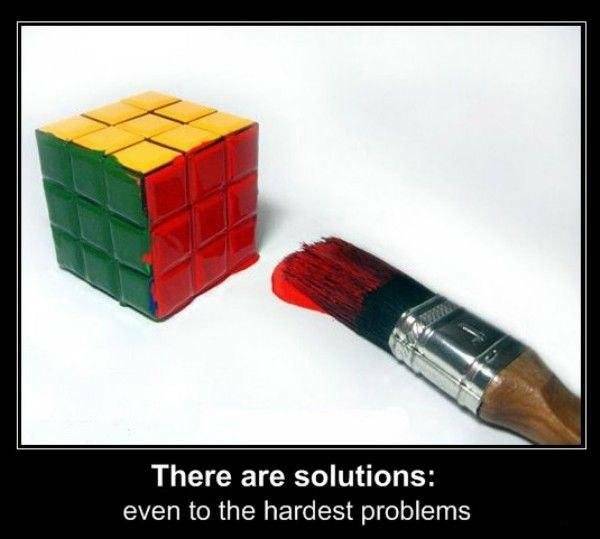 Those that “solved” the problem mathematically didn’t overthink it. They came up with a reasonable solution that fit within the framework of the question, exposing how incorrect the initial statement is. Apparently, the educated were supposed to take forever to figure it out and give up, but the mathematically inclined worked it as a math problem and came up with the “correct” solution just as quickly as the imaginary pre-schoolers would have. The fact is, pre-schoolers may have come up with the “correct” answer by chance, but I believe the assessment of how long they would spend with it is basically accurate. After looking at the seemingly senseless array, they would shrug and move on to something more interesting. 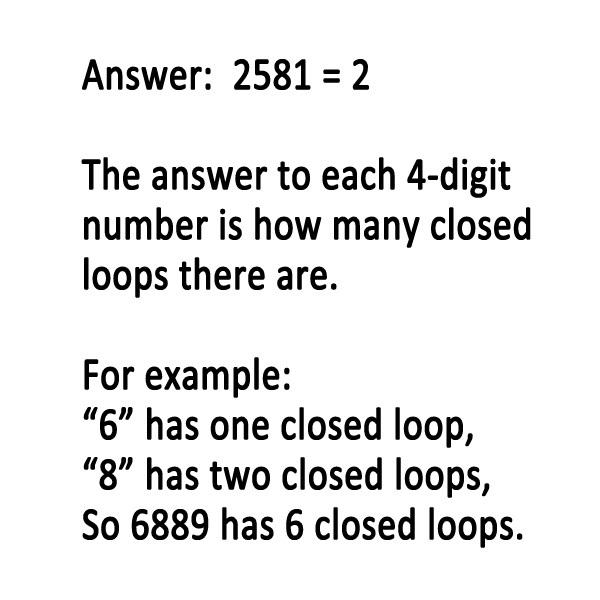 Pre-schooler don’t, regardless of what this question would ask you to believe, see numbers in terms of closed loops. They are more likely to be overwhelmed by 4 digit numbers and not even attempt to figure out the answer. I think perhaps you are reading too much into this. This is supposed to be both fun and challenging. Nothing more, nothing less. There is another way to get to the solution. Let’s ignore the series of four numbers on the left and just work with the single digit numbers on the right. If we start adding from top to bottom, we have series that add up to 10. Once you reach 10, you move to the next secuence. For instance: 6+0+0+4=10. Then 0+0+2+1+4+0+0+0+3=10. Then 5+0+4+1=10. And finally 3+5+0+x=10. Therefore x=2. If we start adding from top to bottom, we have series that add up to 10. Once you reach 10, you move to the next secuence. For instance: 6+0+0+4=10. Then 0+0+2+1+4+0+0+0+3=10. Then 5+0+4+1=10. And finally 3+5+0+x=10. Therefore x=2. Great creativity, though. Thinking outside the box is the only way to get anywhere. i used that way too…adding all the numbers like that and i somehow think the answer would be 2 to make it 10.I guess I’m just lucky. I would never dream to count the loops. I hate to throw a spanner in the works here, but what about the number 4? The puzzle doesn’t use a 4 in any of it’s numbers. Are we counting “circles” within the numbers – OR – are we counting “enclosed spaces” within the numbers? 4 – As written on a computer, DOES include an enclosed space. Therefore it would be “1”. 4 – However does NOT contain a circle. So it would be a “0”. It is loops or circles. That’s a good point however. The creator of the question only did circles, though, since 4 is not included. Plus not everyone writes the number 4 as a closed number. I think the number 4 was left out of this puzzle by the creator on purpose for this very reason…! Causes further brain scratching…! It’s still a damn good problem. Especially because it also shows how we, as humans – especially higher educated people – need to step outside our box and go back to the “basics.” We tend to over complicate our lives all the time, every day. I love this problem specifically for that reason. And it’s funny… so many people have tried to poo-poo the easy (and correct) answer by working out all these calculations, etc. “It has to be more difficult than that.” More so because they’re pissed because they probably didn’t figure it out, yet most kids can figure it out in a few minutes. That was the key right there. And I’m lucky I caught that right away otherwise I probably would have tried to right a damn program to figure it out. Yeah I got it in les than 5 minutes! further explanation: 1+1+1+1=o… 1=0 it was the same for the numbers 2,3,5, and 7. but, 0+0+0+0=4 so 0=1 and that’s the same for 6 and 9. I than put the new values where 8 has been for example 8+0+9+6=5 would be 8+1+1+1=5 so 8=5-3, 8+2. 4 wasn’t needed and 2+5+8+1=0+0+2+0 =2. I figured this out, but i never made the connection to closed loops. i just figured out that 8 was worth 2, and 6,0,9 were worth 1. Civil Engineer – took me 10 minutes… to look at the answer. couldnt figure it out. I think it would be more fun if you put the part about the preschoolers answering it more quickly under the first clue. i would have spent more time working on it. do you think that the fact of being programmer made me think like that ? :) (well it took me no more than 30 minutes anyway:)) was trying to think as pre school child but forgot what pre school child thinks (I am 30 and my child has only 2 months :)) do you thin that age does matter ? Any way it was good one !! Thanks for that !! Excellent! Glad you enjoyed it. Amazing how minds work. You’re a programmer so you think analytically. I’m a graphic artist/website designer, so I think visually. Oh, and the actual “first clue” and most important clue is that pre-schoolers can do it easily. *That*’s the metadata you gave us that leads straight to the answer. That’s all I did. I knew a preschooler could solve it, but also knew their math was very limited. Pretty much count only (thanks Sesame Street!). So what’s left? Visual. I started, went back to the instruction to think outside the box and had it in about 15 seconds (plus another 15 to check the other samples). Sorry. I may have been lucky but looking at the answers and ignoring the zeros there appeared to be a pattern that alternated in the answers. 4 plus 2 is 6. 4 minus 3 is 1. 4+1 is 5. 5 minus x is 3. x is 2. Five minutes. 6666 = 4 meaning 6=1 then 2=1=0=6 and so on. You cannot use some sing as being a value and a sign that has a different value in the same time because that is not logic at all. 2 cannot be 0 and 2 in the same time knowing that 0 is different than 2. It looks logic but it is not. The solution with counting the circles gives more logic than the other one. In order for this problem to be logic then in the left of the “=” sign should be something else than numbers used as signs. you are over thinking things here, in programming, we can declare a variable, that variable can be any combination of letters or numbers, and we assign those specific combinations of letters and numbers a value. normally we can’t use a number as a variable in programming for obvious reasons, however, in theory, we can. Using this programming logic as our guideline, everything to the left of an = sign is a variable, and everything to the right, the sum of those variables. if working with that many numbers confuses you, replace the numbers on the left of the = sign with letters, and it should make more sense. Once we are grown, we look at numbers and letters as conveying abstract information (quantities, sounds). Admittedly, I did look at all the hints and eventually the answer. When I did though, I couldn’t help but laugh. I’m pretty good with patterns, but I would never have thought to look at the figure eight for what it is (two loops) or to look at a zero as one loop. It’s amazing how much our way of looking at things changes as we get older, especially with regards to symbols which we are taught to simply extract information from, rather consider the symbols themselves. I got this one using math, didn’t think of the closed loops things though. as soon as I saw so many numbers cropping up, and the mention of programmers, it got me to thinking of variables, and how they hold value, so I wrote a list ranging from 0 to 9, with equals signs, and started filling in the values based off the alple evidence provided, and had it solved in less than 2 minutes :). Haha, nice, that totally makes sense. Way to go, and way to defeat the purpose of the question. I was thinking modular arithmetic and all this other weird stuff cause I’m in a group theory class right now. Then I read the second hint which said it wasn’t a math problem and sighed. Haha…I was thinking of my nieces and picked up a cell phone since they like playing with their mom’s iPad. And I over thinked it. But the top left numbers all equal zero (1,2,3,4,5,7) then like the rest. found the values for 6,8, 9, 0. Haha loops…wish i could be a kid again. Have a great day! Surprise! I got it in 30 seconds or less I would say. The answer is two. I don’t know if anyone else agrees with me. Perhaps it is because I have had several strokes. Since 0000, 6666, and 9999 are all equal to 4, each individual number (0,6, and 9) is equal to one. 4 and 8 are both equal to 2. If you look at the first one, 8809=6, you’ll see that 8 = 2, 8 = 2, 0 = 1, and 9 = 1. I’m pretty sure that this key works for all of them. Your actually wrong it should be 1. Would never have gotten there 😉 . Even after reading the answer it took me about 5 minutes. Tried all kinds of stuff I know about series/sequences. After the answer said it is about counting the circles … well I tried to transform the numbers so that they would represent a circle xD. Same as Jen. Rather simple problem. I actually find 5 to 10 minutes quite long. I actually solved this with a completely different logic, as a math problem. It never occurred to me that it was about the closed loops, and yet my logic was correct and lead me to the correct answer..
LOL! got it immediately! Does that make me childish (bad) or child-like (good)? learned years ago that if u can’t get the answer u r simply looking at the wrong way. after about 2 mins of looking at it in a few different ways i looked at it as shapes and boom went da dynamite! Took me 3 minutes, I didn’t do it by the number of loops though. I saw that certain sets = certain amounts. For example, 0000 = 4. I reasoned that 0 = 1. So, I knew I needed to know the values of 1,2,5 and 8. I used the same method to reason the values of 1,2, and 5 were 0. Then, I decided that 8 = 2 because 8809 = 6, while 0=1 and 9=1, and 88=4. Therefore 8 = 2 and 2581 = 2. I just figured out which numbers were assigned a numerical value, didn’t think visually, I thought in the sense of code breaking. Through deduction it was pretty easy to figure out 0 = 1, 9 = 1, 8 = 2 and 6 = 1. That’s good. If you notice, though, your logic corresponds to the number of loops in each number. When I looked at the second clue and it said think visually, it instantly was apparent what the key was. Anyone how tell logic behind this??? If you look at the answer I included, it explains the logic.